With the new expansion for Destiny, called “The Taken King”, comes a spark of hope for the seemingly endless amount of people who continued to play this game despite its pitfalls. A lack of story, dialogue, memorable characters, connectivity problems, and a random number generator to make other MMO-like game players cringe, seem to be a thing of the past. No game is without flaws. Usually after a certain amount of time the game developer fixes those flaws or it simply fades away. The good people at Bungie somehow made it a full year without really fixing the larger issues, and still maintained a huge following from their target market. So let’s dive in to what I think are the most important improvements they’ve made, things I’m excited for moving forward, and where they still need work. Better dialogue across the board. 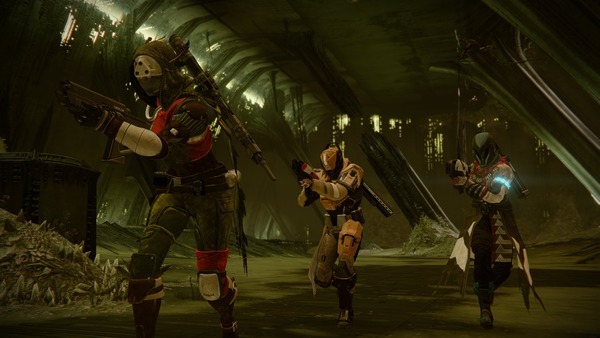 First and foremost, they completely revived the story-telling and dialogue section of The Taken King. Even die-hard Destiny fans had a hard time understanding or grasping the full concept of the game, and for the ones who did, they didn’t learn it from playing the game, but rather from an outside reading source tied to the game called Grimoire Cards. The voice acting was generally forgettable, but now they have really put emphasis on using the great voice actors they have on hand. Nathan Fillion and now Nolan North who has “taken” (get it??) over for the uninspired Peter “Dinklebot” Dinkleage. The dialogue in the game is now quotable, funny, creepy, and actually fills you in on what exactly is happening. In the previous installments for Destiny, there was little to no dialogue between what seemed to be stable characters that were sending you out on missions, they literally stood feet away from each other, always, in the Tower. Now, there are tremendous cut-scenes, that you can actually skip. Cayde-6 (Nathan Fillion) steals the show with his quirky remarks and easily becomes a fan favorite. Lest we forget about the villain in all of this, Oryx (we killed his son in the first DLC) he has a commanding presence and his area or operations called the Dreadnaught provides a fresh and maze-like setting for the guardians to explore and kill enemies. Oh, one little small thing that made me very happy was now the villains and/or cronies have voices now! Never have I played a game before where the only thing I heard from a major villain was screaming. The random number generator of the past Destiny launches or RNG-esus as we like to call it, was cruel, unforgiving, and often made you want to throw your controller across the room. I’m not going to say it’s not a problem anymore, but they have made some improvements to it. Now when you decrypt engrams and run nightfalls and all the normal random drops that you get, it actually takes a look at your inventory to see what you and don’t have and tries not to give you as many duplicates as it used to. The days of 5 of the same primary weapons, and never the one you need or want, seem to be a thing of the past. But I won’t say it’s completely fixed. The Taken King now has a large number of quests that send you all over the Destiny universe, and after playing the game almost every night across three different characters I still haven’t seen the end of them. The further you get along with the quests, the better the rewards, the more secrets of the games you unlock, the more rewarded you feel for putting the time into it. More exciting locales this time. Now, the two things that most excites me the most about The Taken King are, the raid titled “King’s Fall”, and the secrets that different players have unlocked while traversing around the Destiny universe. So far I have raided 4 times since its launch. The other two raids were fun, don’t get me wrong, but players were finding more and more ways to glitch and solo the raid and I don’t think that’s how this game is meant to be played. Almost every section of King’s Fall requires a keen amount of teamwork and couldn’t be done with any less than 4 people. One weak link in your team is quickly pointed out and you either have to hope they pick up the mechanics or the team will likely not make it all the way through. Every encounter is fun and everyone is involved in some capacity. Whereas, if you raided against Crota the only person who really mattered was the guy who carried the sword at the end and became the coveted sword bearer. The loot table still could use some adjusting and the drops from each boss fight are still kind of disappointing but you don’t feel like you wasted your time doing it because the raid is honestly just that fun. Now, the secrets discovered by some players either accidentally or through painstakingly searching for something more offer some great rewards and experiences. It would seem that each “daily heroic mission” offers a secret whether it is more information towards the lore of Destiny, or exotic sniper rifles and exclusive ships, or even the highly touted weapon “sleeper simulant.” Things like this give the players more reasons to keep playing and ups the replay value tremendously. More fun times with friends. For all the good things changing with destiny there are still some drawbacks that can be frustrating. I touched earlier on the loot system for the raid. To say the least, it leaves something to be desired. Also, the added some new game modes for the crucible known as “rift” and “mayhem”. While adding a bit of refreshment to the crucible it still seems to lack a certain punch that the story and raid now offer. Players patiently await the return of Iron Banner and Trials of Osiris, which will undoubtedly be what the PvP gamers are looking forward to. There are still some connectivity problems but often times that isn’t the games fault. The biggest problem facing the people at Bungie and The Taken King, is the price tag. A loyal destiny gamer who has purchased all the DLC and the disc has most likely paid anywhere from $100-$150 for everything. But, with the new collector’s edition, someone who has never played Destiny before could go out and get the disc and the all the DLC for just $60. If there is a world where that makes sense to a rational consumer then I don’t ever want to go there. Despite all the problems backlash and nay-saying that Destiny has faced, Bungie has continued to make good progression fixing problems and listening to what the community is calling for. Destiny: The Taken King, is the culmination of a community outcry reaching the ears of the developers and a great foundation for a game. There is always room for improvement, but this launch proved that Bungie still holds some of that magic they made with Halo and they are trying to outdo themselves in every aspect of gaming. On another note. Soon, I will be streaming with a few of my clan members doing miscellaneous things around the universe of Destiny, maybe even raiding! Stay tuned to the one place you can catch-all the action with some of the PlayLegit crew! Previous What Do You Think About The Star Wars Battlefront Beta? I quite Destiny almost a year ago and haven’t looked back since. It’s actually the first game I sold in over 10 years. Even though they added in more content it’s still not enough for me to want to buy this game again. I would like to add that when compared to other games Destiny is still lacking content imo.